Look, I just want a VR game to make me feel like Neo from The Matrix. Does Space Pirate Trainer do that? It does! Sign me up. 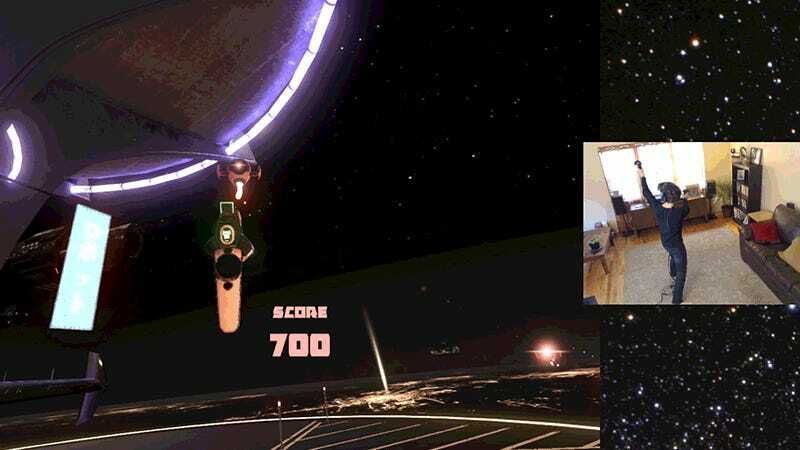 What it is: Space Pirate Trainer is an early access shooting gallery game that basically takes the concept behind Galaga or Space Invaders and turns it into an immersive VR game. You have one gun in each hand and you use those guns to shoot enemy drones out of the air before they shoot you. If a drone gets off a shot, its bullets will slow to a crawl as they head toward you, which lets you pull off some sick bullet-time dodges and even shoot them out of the air. And that’s about it! It’s really straightforward, and really fun. Honestly… it’s one of the most flat-out fun VR games I’ve played. I’m looking forward developer I-Illusions adding more variety to the game, but even in its stripped-down early access state, I’ll keep chasing high scores. Throughout the next couple of weeks we’ll be posting more short videos like this one to give an idea of how these VR games work. For more detailed thoughts on the VR headsets themselves, check out my writeup of the Oculus Rift and Nathan Grayson’s take on the HTC Vive.